As the days become increasingly warm and my calendar fills to the edges, my crochet time dwindles, and the gorgeous bins of wool and alpaca lose some of their appeal. So this summer I have set a new goal-try something new. Nothing excites me about crochet like a new technique, yarn, or project type. And with the heat in mind, I turned my eye toward crochet jewelry. Jewelry is little, so you don't have to worry about an extra layer of fabric across your lap when the weather is hot and sticky, and jewelry offers a larger variety of new techniques to learn in small, quickly-finished projects. Let's look at some of my favorite jewelry patterns from the Crochet Me Shop. 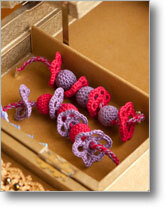 Many crochet jewelry projects are created with cotton thread. This makes them lightweight and allows you to work small motifs and lace perfect for necklaces, earrings, or bracelets. The Bauble Bracelet by Linda Skuja is a great introduction to crocheting with thread. 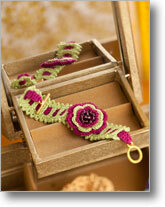 This easy bracelet is made up of flower motifs and crochet-covered beads strung on colorful chains. Whip up a stash of beads and flower motifs and invite the kids in your life to help you construct the final bracelets. I have a niece who would love to help me make jewelry this summer. Working crochet stitches over the top of a solid object, as with the beads in the Bauble Bracelet, can give crochet jewelry a solid shape. I love the way Marguerite's Earrings by Brenda K. B. Anderson use metal loops to create the crochet-covered frame in which to showcase a bit of lace. The resulting earrings are lightweight and fun, perfect for a summer sundress! Crochet thread comes in a variety of bright colors, so take advantage of the selection and create a pop of color for your wardrobe with a colorful bracelet. I love the Irish Rose Bracelet by Karen Hoover. This simple pattern pairs two fun colors of thread with a traditional Irish crochet rose and a dainty picot edging to create a summer accessory for any age. A few beads sewn to the center of the rose add a touch of sparkle. Add crochet jewelry to your wardrobe this summer and try something new with these fun and quick projects. Visit the Crochet Me shop to download the highlighted jewelry patterns as well as more great crochet accessory patterns. P.S. What is your favorite type of crochet jewelry?